The YaSM Process Map for Visio includes an Excel® repository and the Visio® repository add-in to make your task of adapting the YaSM process model to the needs of your organization considerably easier. Watch the video: How to manage the objects of the YaSM process model with a simple Excel spreadsheet (9:31 min). Most BPM applications (software specifically designed for managing business processes, like ARIS™) feature a central repository of objects, such as processes, roles, information items, etc. Such objects can be defined once and then be used as building blocks in the organization's process model. Visio is kind of a special case: Although many organizations use Visio for documenting and managing their processes, it does not have in-built support for an object repository. This is why the YaSM Process Map includes a Visio add-in which allows maintaining a repository of objects in a simple Excel table. The Excel repository is a central place where to define and manage all descriptive information and link data for the processes, data objects and roles used in the Visio diagrams (where they are represented as specific types of shapes). For example, the Excel repository contains a table named 'Process', where you will find one row for each process defined in the YaSM Process Map. Each row contains a number of cells which hold the processes' unique IDs, their names, descriptions, link information, etc. The repository add-in establishes the link between the Excel repository and the Visio process diagrams. Once the add-in is installed, a number of additional commands are available in Visio to read information from the repository and write it into the Visio shapes - where it is stored in the shape data fields. You are thus able to quickly add new process, role or data object shapes to the Visio diagrams with a mouse-click; the shapes' links and descriptions will be set automatically with the information specified in the Excel repository. The add-in also provides commands to update your existing shapes with current information from the repository, for example if you need to change the name or description of an already-defined process. Just like the Visio process diagrams, the Excel repository is customizable to your organization's needs. In particular, you can change existing data, or add completely new entries. 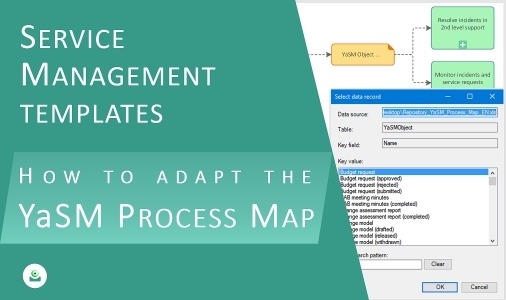 Adapting the YaSM Process Map: How the YaSM repository and the Visio add-in help you with adapting the service management processes to the needs of your organization.